Blowout Sale! 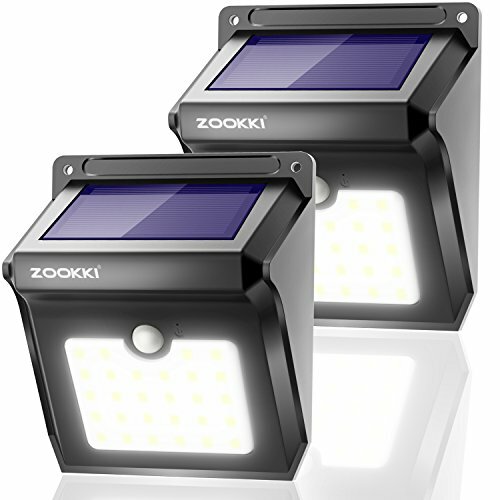 Save 76% on the Solar 28 LED Motion Sensor Lights Outdoor, ZOOKKI Wireless Waterproof Solar Powered Motion Sensor Security Wall Lights for Outside Garden Gate Driveway Stairs Patio Yard Deck Pathway Garage 2 Pack by ZOOKKI at EOS Lighting LLC. MPN: ZK-SL-28D-2P-US. Hurry! Limited time offer. Offer valid only while supplies last. ☀【Durability, Quality & Performance】Equipped with 28 powerful LEDs, 1200mAh rechargeable Li-ion battery and bright 400 Lumens, these reliable outdoor solar lights have passed every certification of TUV, CE, RoHS and FCC test. ☀【Water-resistant & Heat-resistant】 Made of high-impact ABS material, this outdoor solar motion sensor light is IP65 waterproof which can withstand rain, snow, sleet and other extreme weather conditions. ☀【Easy Installation & Energy Saving】Just use the Key Pin to activate the solar powered wall lights and fully charge them under directly sunlight. Recommended optimum installation height: 6.5-13 feet. No dim mode helps to extend the work time and life span. ☀【Large Lighting Area & PIR Motion Lights】120º wide-angle motion sensor design, high solar conversion efficiency, automatically "ON" by detecting motion within 3-5m at night or in darkness and "OFF" after about 30s without continuous motion. ☀【Warranty Policy】We promise a 30-Day Money Back Guarantee and 90-Day Limited Product Warranty. Great outdoor solar security lights for garden, patio, yard, driveway, front door, garage, stairs, etc. If you have any questions about this product by ZOOKKI, contact us by completing and submitting the form below. If you are looking for a specif part number, please include it with your message.